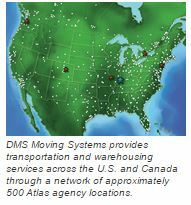 When your relocation project calls for warehousing, DMS Moving Systems brings the experience and capacity for any storage challenge. Customers have trusted our expertise in transportation and warehousing for years. With our network of approximately 500 Atlas agencies, we connect with the resources of quality warehousing companies across the U.S. and Canada. Our transportation and warehousing experts will answer your questions. Contact DMS Moving Systems today to request a free quote.